The jury – unless you are the Fed and Ben Bernanke or the Congressional Budget Office, which cannot make lower growth assumptions without really blowing their deficit projections out of the water – is pretty well in on GDP growth: it’s going lower. Ed Easterling and I wrote a recentThoughts from the Frontline on multiple pieces of research suggesting slower future growth. We asked the question, “So what about stock prices; will they follow suit?” Our thought was that, over time, they would. The main new point I wanted to make was that resource costs are treated like GDP increases. Hence, prior to 2002, steadily falling resource costs were treated as a debit when of course steadily lower costs were a great help to well-being and utility. We calculated that adjusted GDP actually grew 0.2% a year faster than stated. Conversely, since 2000, rising costs were a detriment, not a benefit, as shown in GDP. Treated correctly as a negative, resource costs would have reduced real growth by 0.4% a year. This squeeze on growth will continue as long as resource costs rise faster than the growth rate of the balance of the economy. … it is worth remembering that we don’t really know what caused resource prices to spike from 2002 to 2008 so impressively. This was a much bigger price surge than occurred during World War II! Indeed, it may easily turn out that the resource price rises will squeeze future GDP growth substantially more than our estimates. In any case, a careful reading of Jeremy’s work is always instructive. This one is an important think piece, as the direction and magnitude of future GDP growth will be critical as we make business, retirement, and investment decisions. Simply talking past performance is risking your future on the unlikely prospect that the future will look like the immediate past. Have a great weekend. I am enjoying being at home this week. I will be in Palm Springs at the California Resource Investment Conference, February 23-24. My good friend Grant Williams, who writes the blockbuster Things that Make You Go Hmmm… and the Mauldin Economics’ Bull’s Eye Investor letter, will be there, as will the best resource investor I know, Rick Rule, along with my favorite data maven, Greg Weldon. There is a full two-day slate of speakers. The event is free to investors and is always fun, and it’s a great time of year to be in California (hate the pensions, love the weather). Come see us! You can read all about it and register at the Cambridge House website. This quarter I will review any new data that has come out on the topic of likely lower GDP growth. Then I will consider any investment implications that might come with lower GDP growth: counter intuitively, we find that investment returns are likely to be more or less unchanged – a little lower only if lower growth brings with it less instability, hence less risk. Finally I will take a look at the reaction to last quarter’s letter, specifically about my outlook for lower GDP growth. Some information came out after the 4Q 2012 Letter or was missed by us and is worth mentioning. First, the Congressional Budget Office slashed its estimate of the U.S. long-term growth trend from 3.0% to 1.9%! Given the source and the magnitude of the adjustment, I think it is fair to say that their number is “close enough for government work” to our 1.5%. At least it is within negotiating distance. Next, a report from Chris Brightman of Research Affiliates actually came out a week before ours and concluded that long-term GDP was 1.0%, a number that really corresponds to our 1.5% because his report has no reference to our two special factors, resources and climate, which take our 1.5% to 0.9%. I was encouraged by the solidness of his research. It also led me to an article in the Financial Analysts Journal (January-February 2012) by Rob Arnott and Denis Chaves. Rob has been writing about the effects of age cohorts on investment returns for almost as long as I can remember, with the central idea that older people are sellers of assets – houses as well as stocks – that younger members of the workforce buy. But they also include the aging effect on GDP growth, which he shows taking a real hit in all developed countries (except Ireland). They are commendably careful in suggesting that their model may be wrong. When or if you read this article, you will certainly hope that it is indeed wrong, for their models estimate from past experience a far greater drop in GDP growth than our work assumed last quarter. And they certainly attacked that aspect in far greater detail than we did. We had included in our report the effect of aging on the total percentage of the population of working age: there are simply fewer workers and more retirees in the distribution. But Rob and Denis (sorry for the liberty) introduce the incremental idea, apparently provable, that older workers lose productivity, no doubt much more in heavy manual work than, say, in writing this. But definitely alas, including all activities with dire consequences, they argue for productivity and GDP growth. 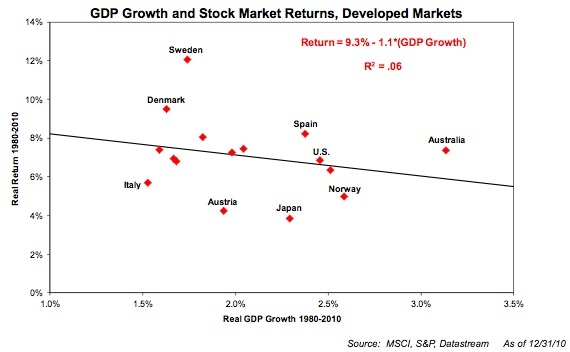 Would Lower GDP Growth Necessarily Lower Stock Returns? All corporate growth has to funnel through return on equity. The problem with growth companies and growth countries is that they so often outrun the capital with which to grow and must raise more capital. 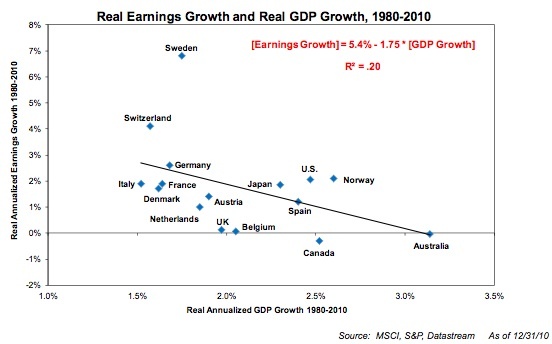 Investors grow rich not on earnings growth, but on growth in earnings per share. There is almost no evidence that faster-growing countries have higher margins. In fact, it is slightly the reverse. The history of market returns completely supports this replacement cost view. The fact that growth companies historically have underperformed the market – probably because too much was expected of them and because they were more appealing to clients – was not accepted for decades, but by about the mid-1990s the historical data in favor of “value” stocks began to overwhelm the earlier logically appealing idea that growth should win out. It was clear that “value” or low growth stocks had won for the prior 50 years at least. This was unfortunate because the market’s faulty intuition had made it very easy for value managers or contrarians to outperform. Ah, the good old days! But now the same faulty intuition applies to fast-growing countries. How appealing an assumption it is that they should beat the slow pokes. But it just ain’t so. And we at GMO have (somewhat reluctantly for competitive reasons) been talking about it for a few years. Would Lower Real Rates Lower Stock Returns? Economic theory can’t get everything completely wrong, and perhaps one thing economists have gotten partly right is that the risk-free rate has some relationship to the growth rate of the economy. If that rate approaches zero, there is clearly less demand for new capital; in fact, given accurate depreciation accounting, there would be zero net new capital required. It is also easy to see the risk-free rate settling at something around nil. The risk premium, however, might be little affected. The demand for risk capital – e.g., to replace an old plant, resulting in no new net growth – would still require that the investor expect an adequate return. If it looked likely to be less than that, he would of course withhold his capital until inevitable shortages pushed up profits enough for the corporation to get a satisfactory return, as we have often discussed. However, and I bring up this complicated issue with trepidation, it does seem possible that in a world with both lower growth and a lower risk-free rate that the risk premium might also drop a little. A lower growth world might plausibly be less volatile because managing a world where the apparent growth is 1.5% (and real growth is 0.9%) is likely to be easier to stabilize than one (as from 1870 to 1995) appearing to grow at 3.4% but actually growing at 3.6%, almost four times higher. (Another way of stating my negative 0.5% resource adjustment, by the way, is to say that the economy’s costs are growing at 1.5% but that its utility – or something closer to utility than GDP anyway – is only growing at 0.9%.) If returns to equity holders are to fall, then P/Es must paradoxically rise to bring yields and total returns down. Yet, as always, equities have to sell at replacement cost. Therefore the books have to be balanced by returns on equity falling. This after all seems reasonable – if returns on T-Bills drop and returns to stockholders drop, then a system in balance would suggest that returns on corporate investment also drop. This adjustment would likely be modest and should only occur if a lower-growth world were to become less likely, which is far from certain, merely plausible. With a few months to reconsider the data, old and new, I would have framed last quarter’s issue on declining growth differently to emphasize how routine, even friendly, most of our inputs were. The main new point I wanted to make was that resource costs are treated like GDP increases. Hence, prior to 2002, steadily falling resource costs were treated as a debit when of course steadily lower costs were a great help to well-being and utility. We calculated that adjusted GDP actually grew 0.2% a year faster than stated. Conversely, since 2000, rising costs were a detriment, not a benefit, as shown in GDP. Treated correctly as a negative, resource costs would have reduced real growth by 0.4% a year. This squeeze on growth will continue as long as resource costs rise faster than the growth rate of the balance of the economy. Further, as the percentage of the GDP taken up by resources has recently more than doubled (2002 to 2012), the squeeze on the balance of the economy would also be doubled even if the rate of cost increases stayed constant. Last quarter I estimated that continued increases in resource costs from now to 2050 would lower GDP growth by 0.5%. To prevent that 0.5% effect from accelerating as the share of resources in GDP rises, the rate of resource cost increases must decelerate from the recent 7% a year to a much more modest 2% a year by 2050. (By then, of course, it might well be over the current 7% … it is just not knowable.) As one can see, this is not nearly as draconian an assumption as it might initially appear to be and in this context it is worth remembering that we don’t really know what caused resource prices to spike from 2002 to 2008 so impressively. This was a much bigger price surge than occurred during World War II! Indeed, it may easily turn out that the resource price rises will squeeze future GDP growth substantially more than our estimates. Although our low estimate of future GDP growth attracted attention and plenty of opposition, it was only produced as a necessary backdrop to show the potential significance of our two new points: the large deduction for a cost squeeze from resources (0.5%) and a very slight but increasing squeeze from climate damage (0.1 rising to 0.4 after 2030), which latter deduction is considered almost ludicrously conservative by that handful of economists that study the costs of climate change. Our work on the traditional aspects of GDP growth was approached by us as a necessary chore; we were not looking for trouble. Consequently, we tried to keep it simple by using the obvious data sources. “Where on earth did GMO get its pessimistic population data?” ran one complaint. Well, would you believe the U.S. Bureau of Census? And as for productivity, we extended the 1.3% average for the last 30 years out for 30 more years. This is clearly a very friendly assumption given: a) the recent 1.3% in productivity growth of the last 30 years had declined a lot from its 40-year surge of 1.8% after World War II; and b) the fact that the segment of much higher productivity – manufacturing – has declined to a mere 9% of total labor from 19% in 1980 and continues to decline. Even my one override, -0.2% a year for the next 18 years as a result of much-reduced capital spending, seems, based on econometric modeling, to be a very modest debit. For there to be so modest a negative effect needs capital spending to drift back toward normal in the relatively near future. And even then this -0.2% effect was exactly offset in our forecast by a +0.2% bonus for the unanticipated surge in fracking activity and the ensuing burst of momentarily cheap energy. So why the fuss? The resource debit merely reflects the remarkably odd GDP accounting that counts an unfortunate surge in necessary costs as a benefit, and the remaining 1.5% is merely reflecting recent data. Higher growth assumption, Mr. Bernanke should be aware, must prove longer-term improvements in productivity or, tougher yet, increased labor input. Of course, in the short term there are always temporary behavioral responses. If GDP growth drops unexpectedly, corporations might easily be caught mis-budgeting or overexpanding (although this current ultra-cautious U.S. corporate system, which only reluctantly makes capital investments, is unlikely to be caught out too badly), and perhaps more importantly investors may be shocked by continuous revenue warnings, which might cause the market to sell off. Recent corporate announcements, while usually still claiming exceptional profit margins and generally hitting earnings targets, are increasingly missing revenue targets and issuing future revenue warnings. We must admit, though, that recent revenue warnings have not stopped the market from rising, nor has the unexpectedly slightly negative growth for the fourth quarter GDP. Within sectors there would quite likely also be a shift in preferences. Growth stocks might seem relatively more attractive: “If the system isn’t growing, the least I can do is pick a few companies that clearly are still growing.” Perhaps quality franchises would also become more appealing with the logic being that at least in the transition to lower top-line revenue growth, competition would become more severe and, hence, defensive moats even more than usually desirable. The normal capitalistic response described above runs smack into the new tendency for corporations to either sit on money or buy stock back (regardless of how expensive it may be! ), which works in the opposite direction to create shortages, drive prices up, and, as a by-product, lower job creation and GDP growth. So where does this all come out? You tell me. All that I know is: a) if we in the U.S. don’t invest, others will and it will, in the longer run, definitely end badly; b) that even if there is a lower-return world in the future it is still better to own the cheaper assets; and c) it behooves buyers of “cap rate” type assets like real estate to realize that the current low rates are flattered by current Fed policy, which will, like everything else in life, pass away one day, leaving them looking overpriced. It can’t be too soon for me. In the meantime for us at GMO it means emphasizing care and maintaining a heightened sense of value discipline, not only in stock selection, as the whole world is once again bid up over fair value in a way so typical of the post 1994 era, but also in forestry and farmland. GMO has investments in those areas too and recognizes the need to sidestep overpricing by emphasizing the nooks and crannies. Fortunately there are more nooks and deeper crannies in forests and farmland than there are in almost any other area, certainly including stocks. This doesn’t really fit in with a quarterly letter emphasizing important good news, but being about the Fed, I have to make an exception. The Fed appears to be still assuming a 3% growth rate for future U.S. GDP. It would be safer and more confidence-inspiring, now that Bernanke appears to take his responsibility for growth seriously, that he at least have a reasonable growth target (preposterous as that notion is to me that the Fed should or even could affect long- term growth simply by messing about with interest rates). The growth in available man-hours has definitely declined by about 1% a year, yet Bernanke’s assumption for our GDP’s normal trend growth appears unchanged at its old 3%. Ergo, he must be assuming an offsetting rise of 1% in productivity. But why? We should treat these assumptions quite seriously for this is famously (for me) and painfully (for all of us) the man who could not see a 33⁄4-standard- deviation housing market, and indeed protested that all was normal, etc., etc., etc. (Dear handful of niggling readers, this 33⁄4-standard-deviation event is calculated on the assumption of a normal distribution, as is often done in investing, even though we [especially at GMO] know this is not true but is just a convenient statistical device. In fact, we at GMO know quite a bit more on this topic for we have studied more or less all assets for as long as we can find data and we have found a remarkable total of 330 “bubbles,” 36 of which we call “major, important bubbles,” which we define as 2-standard-deviation events, given the same assumption. Well, a 2-sigma event should occur every 44 years in a normally distributed world and they have occurred every 31 years. This is much closer to random than we had previously thought. Yes, financial asset data is fat-tailed; that is, there are more outlying events than are found in a normally distributed series, but they are not extremely fat-tailed. They show up as 2-sigma events but occur as often as 1.8-sigma events would occur in normal distributions. Extrapolating, we can assume that Bernanke’s 33⁄4-sigma housing bubble would occur, adjusted for our fat-tailed real-life history, not every 10,000 years, but somewhere more like 1 in 5,000 years! I previously used “a 1-in-1,200-year event” as a casually selected very large number to describe the 2006 housing bubble. But under challenge, these current numbers are more accurate. No, this does not mean we have 10,000 years of data or even 5,000. It is just statistics, full as always of assumptions, which in this case we hope approach rough justice. What it does definitely mean, though, is that it was extraordinarily unlikely that the extremely diversified U.S. housing market would shoot up like it did and, frankly, even more remarkable that Bernanke and his timid or incompetent advisors could miss it. This is a doubly amazing miss because his and Greenspan’s policy caused this bubble in the first place!) In comparison, his willingness to target an unrealistic 3% level for GDP growth is statistically a microscopic error, a picayune mistake. Unfortunately, though, in the hands of probably the most influential man in the global economic world, it is an extremely dangerous one. I like the analogy of the Fed beating a donkey (the 1% growing economy) for not being a horse (his 3% growing economy). I assume he keeps beating it until it either turns into a horse or drops dead from too much beating! Fine-tuning economic growth, an impossible job for the Fed anyway, is hardly likely to get any easier by badly overstating trend-line growth. It seems nearly certain, therefore, that the Fed will keep trying to whack the donkey for far too long. The likely consequences of this policy are, to be frank, over my head, but my colleague Edward Chancellor will address them briefly if I can nag him effectively. Courtesy of the above Fed policy, all global assets are once again becoming overpriced. This reminds me of the idea sometimes attributed to Einstein that a workable definition of madness is constantly repeating the same actions but expecting a different outcome! But, as always, asset prices are not uniformly overpriced: emerging markets and, we believe, Japan are only moderately overpriced. European stocks are also only a little expensive, but in today’s world are substantially more risky than normal. The great global franchise companies also seem only moderately overpriced. Forestry and farmland, which is not super-prime Midwestern, is also only moderately overpriced but comes with our nook and cranny sticker attached. But much of everything else is once again brutally overpriced. Notably, U.S. stocks (ex “quality”) now sell at a negative seven-year imputed return on our numbers and most global growth stocks are close to zero expected return. As for fixed income – fugetaboutit! Most of it has negative estimated returns on our data, and longer debt, as always, carries that risk that may be slight in any period, but is horrific if it occurs – accelerating inflation. When one combines the apparent determination and influence of those who do the bullying with the career risk and short-termism of the bullied and the desire of the general public to believe unbelievable good news, these overpricings can go much further and the Fed can win another round or two. That’s the problem. A clue to timing would be when we begin to hear more passionate new era arguments: profit margins will always be higher; growth will snap back to 3% for the developed world; and new ones I can’t think of … maybe “when the discount rate is this low the Dow should sell at, perhaps, 36,000.” In the meantime, prudent managers should be increasingly careful. Same ole, same ole.